The Lake District in the summer is one of the most beautiful places I have ever travelled to. Little did I know, its beauty is only increased in the winter. I’ve been twice in the past week, once on the 16th January and once on the 22nd. The first time, the Lakes were covered in a thick sheet of snow which was absolutely beautiful. However, the snow didn’t let up at any point during the day, causing an issue to snap any decent photos, due to the snowflakes being so big. We arrived in Windermere by train and caught the 516 Stagecoach bus to Elterwater (a beautiful little village). From Elterwater, we set off East and walked for a few hours. camera every ten seconds. When I stopped however, I used a slightly longer exposure (in the hope to remove some of the snow falling) – around one to two seconds – and a high f-stop – around f/10 to f/12. Snow photography is something I think I’m going to have to work on – for the amount of photos I took, I wasn’t best pleased with the results. Moving to my more recent visit yesterday, it was amazing weather. It had rained considerably in the morning but by the afternoon there wasn’t a cloud in sight. 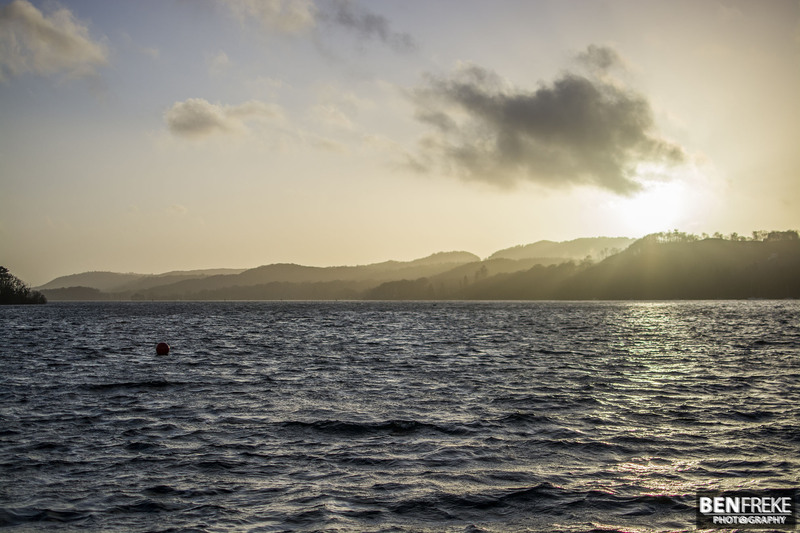 Again, we arrived at Windermere but this time walked towards Bowness-On-Windermere and then got the ferry across. We arrived at the Claife Viewing Station on the West shore of the lake (location). Believe me, if you want a great view of the lake, this is one of the best places to go. I took a timelapse of the sunset and then moonrise. It was amazing! The Moon came up over the East of the lake as the Sun set over the west. We had perfect conditions, so I set up the camera looking over to the East of the lake and began taking a timelapse. Then, using the Nikon’s interval photo shooting mode I instructed the camera to take 999 photos (it’s the maximum and you can stop it before then). I set the interval to 3 seconds (as there was some high wind and clouds heading over). Then, I sat and waited – I adjusted the exposure intermittently with the decreasing light (that’s why it’s hard to edit). A great tutorial for a sunset time-lapse (the one I used when I first learnt) is made by Serge Ramelli (link). Finally, heading back I managed to snap two of my favorite shots during my winter lake visits. The first is a 150 second exposure of a boat light on the West shore, taken from the East shore. I like this, mainly because of the docking light on the right of the image. I think it’s quite eerie – but anyway that’s one of the photos. The other is a long-ish exposure of Bowness-On-Windemere at night. It turned out better than I was expecting and just looks like the typical night time city lights reflection. It just looks good, and why not?